Before we get on to winning games, I want to make sure you know how to play them at all. Let’s make sure you have a game, an environment in which to play it, access to opponents, and an understanding of how to gain basic proficiency. You first need to choose a game to play. You probably already have a game in mind, and it might not have occurred to you to try to win at other games. Different games require different skills, and it is not always clear to the beginner or even the intermediate which skills a particular game really demands. It’s best, of course, to play a game you are well suited to play. I recommend a game that allows all players to start with equal materials and advantages. For example, a fighting game allows players to start with different characters, but all players are free to choose any character they like before the match begins. Magic: The Gathering is a card game that allows players to bring different decks to a tournament, but assuming all players have equal access to all cards beforehand (which you must assume at the tournament level of play), then anyone could have brought any deck. But games based on “leveling up” a character such as many massively multiplayer games allow one player to have material advantage at the beginning of a “match” merely because he put in more time than the other player. Seek out games that do not artificially stack the deck, but instead reward only the player-skill that one takes into a game. Don’t choose every game. 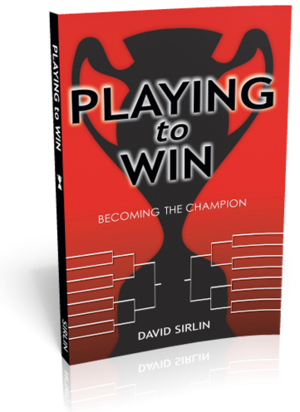 Although it’s noble to believe you will simply “play to win” at all games you encounter, it’s better to be realistic. Choose one or two games at most unless you have both an exceptional amount of free time and gaming skill. For example, if your focus is on a particular first-person shooter game, you might dabble with or even be expert at other games in that genre. You might also play the occasional game of Scrabble with your girlfriend, Texas Hold’em poker with the guys, and Magic: The Gathering here and there. To even attempt to truly win at any one of those games is a full-time job. You might not be aware of international Scrabble tournaments, the World Poker Tour, or Magic’s Pro Tour, but every one of those games has a world class following of players. Competing at a high level in just one game is a daunting task. You should recognize the level of commitment you are willing to live with for a particular game, and be content with it. There are a few games I take very seriously, and the rest I simply enjoy as much as I can with my limited commitment. For example, I have read many books on chess and played chess occasionally over the years. On the whole though, I am a terrible player. During a game of chess, I do everything I can (within the scope of the game) to win, but I do very little to improve myself over the long haul. I am not a member of the chess community, I do not seek out superior chess players as mentors, and I do not even seek out the readily available wealth of opponents free to play on the internet. In a very limited way (during a particular game only), I “play to win,” but the whole endeavor of chess playing is an occasional “fun” activity for me, not a serious attempt to dominate the chess world. I’m comfortable with that, because I realize I can only dominate so many worlds. Even so, I’ve invested quite a bit of mental resources on chess compared to other games. I used to play a few games of Boggle per week, and again, I tried to win those games, but I did absolutely nothing outside the games to improve. I was comfortable with that because any time I might have spent improving at Boggle was better spent improving at games I took more seriously. Anyway, back to choosing your game. Another factor is a game’s ability to hold together at high levels of play. Many games degenerate when played at high levels of skill, and many other games only appear to degenerate but actually don’t. If you choose a mature game such as chess, you can be assured of some real gameplay at high levels, but newer games are a gamble. This may seem like a minor issue now, but whether a game breaks down as you increase in skill is, in fact, a major issue. I would even say that most serious players of most games will reach a point where they feel that their game breaks down and no longer requires any real strategy. Often, this is when they have discovered some powerful tactic that seems to have no real counter, thus removing any strategic thought from the game. I would also go so far as to say that most of the time, the player will be wrong and there will exist either counters to the tactic or far better tactics, and that the game does indeed have more depth left to it. Sometimes though, there is no more depth and the player is right. Unfortunately, this looks suspiciously like the case where the player is wrong. It will take some wisdom to know whether you should continue with a degenerate game in order to discover its further depth or whether to abandon it in favor of a better game. This is all too much to think about now, but beware that if your competitive game of choice is not an old and mature one, you will probably face this issue. Creating an environment for yourself to play your game is vitally important. The champion is forged in fire, not in a vacuum. You need physical access to the game and access to a variety of opponents. It helps greatly to have friends who are players of the same game or to make friends who play it. If you truly walk the path of the champion, you will eventually find yourself closely involved with the community of players who play your game. The sooner you can become connected to this community, the better. They have a great deal of knowledge about the game and about tournaments and events surrounding it. You will find keepers of secret knowledge about your game, and you will find the very best players of the game as you approach the inner circles of the game’s community. Having physical access to your game cannot be stressed enough. If it is a video arcade game, you must live or work or go to school near an appropriate arcade. (By the time this is published, you can read about what an “arcade” is in a history book.) If it’s a PC game, you must have ready access to an internet PC. If it’s poker, you must have easy access to a card house where poker is played. If your game can be played remotely (over the internet), then you have the potential, at least, to play a very wide range of opponents, assuming you prove you are worthy to play them. If your game requires face-to-face opponents, you are well advised to live in a city where the best players of that game live, if possible. If this is not possible, you must realize that the players who do have access to the elite experts of the game have an advantage over you. If you don’t have access to expert players face-to-face where you live, you might consider choosing a different game to win at. Another thing you will need is a lifestyle that will allow you to devote the time, money, and mental energy to playing your game. Since this is significant, you are well advised to play a game you find “fun” or at least to find “fun” in the competition or personal challenge of improving because building your life around a game that feels like “work” is a mistake. Building your life around any game is arguably a mistake, but I’ll pretend to ignore that point, as it sure helps when it comes to winning. Your first aim should be to learn the rules of the game, how to perform basic actions and moves in the game, to understand which legal moves are available to you, and of course the conditions required to win and lose the game. At this stage you should also try to learn the lingo used by other players and you should become comfortable performing basic moves. In some games, it will take quite some time to overcome the feeling of awkwardness of a beginner. Note that none of these tasks strictly require an expert player to aid you. You can read rulebooks and FAQs, and simply play. An expert player serving as a mentor (not yet an opponent) is extremely helpful though. Either he can teach you the lingo and basics or, if you already know this, he can explain how the game is really played. It can also be very useful to watch expert players play each other at this stage (either in person or from recordings), but playing against them directly might be overwhelming; it depends how proficient you are in your beginner stage. Watching expert or intermediate players will also reveal “bread and butter” tactics that you will need to learn, and probably a lot of other things that are over your head for now. Once you have done the above and understand the basics of the game, the next task is to learn a few “bread and butter” tactics of your own. You should learn effective, easy to execute sequences of moves that give you a shot at winning. The goal isn’t to develop new sequences that have never before been seen; the goal is to be effective. When an opponent plays extremely poorly, you should at least have some idea about what you are supposed to do to seize the game from him. Depending on the game, there may be different “bread and butter” tactics to move you toward winning and to actually seal the game with a win. Also depending on the game, you may need to practice executing these tactics outside of the chaos of a real game. If even the basic tactics require a great deal of practice, then attempt to develop these skills as quickly as possible in a controlled environment. Do not dwell too long on isolated, laboratory practicing at this point though, because you need to dive into real games. I know some players who, even at this early stage, wish to play only against expert players. I personally prefer to play against average and poor players for a bit, as a way to hone my skills of attacking efficiently. I think the important thing at this stage is simply to play as much as possible, regardless of the skill of your opponents. Familiarization with the game is paramount. When you do play against experts, they will probably beat you badly. Playing them will teach you what not to do. Do this, and they punish you horribly. Do that, and the game is lost. Playing them will teach you which moves are “unsafe” or “terrible,” and you must learn to make fewer and fewer of these moves that will lose you the game. Of course, if all you do is remove moves from your repertoire, you are playing a safer game that is less likely to be lost at any moment, but you also must make moves to win! You should be making good progress on not losing so quickly when you play these experts, but how can you learn to win? Watch what the experts do to you. They are likely extremely efficient at stealing a game. When you make a mistake, watch exactly how they punish you. Watch exactly which sequence they use to end the game. Again, some of my friends swear by only playing against experts, and there is surely much to be learned from that. But once you have learned how the experts win, it can be very difficult to practice those maneuvers against them. The opportunity to exercise your winning muscles will show itself only rarely. It is at this point that I prefer to play against weaker players. The weaker players will present plenty of opportunities for you to practice your endgame skills. You can try variations on your attack patterns all day on them. You can hone your skills at ending a game. Often, attacking patterns will leave you vulnerable, so practice until your attack sequences leave no gaps of vulnerability. You won’t truly know if you’ve accomplished this until you play against the experts later, though. The idea is to use the beginners as a way to get an extraordinary amount of practice in the tactics that win the game in a short amount of time. The experts rarely allow such situations to arise, but when they do, you will need to capitalize on them professionally. When the opponent makes a fatal mistake, you need to be able to confidently take control of the game and win it. This act must be natural, something you’ve done a thousand times before. When the rare opportunity to win presents itself while playing the expert, you shouldn’t have to think “I’m pretty sure I can win this in theory. The textbooks say I should do X.” You should take control of the game simply, quickly, and instinctively, just as you have done countless times against the beginners. The experts keep you honest. They remind you, “That was not a safe move. You cannot trick me with that. That will not stop my advances.” The expert also teaches you how to win, but presents only very few opportunities to practice winning. The beginner, on the other hand, will let you practice winning until it’s second nature. At that time, you must return to the experts. There will soon come a time when beginners and even intermediate players are of very little use to you. They do not know how to punish your mistakes properly, so you can develop bad habits. They fall for tricks that are not “real,” meaning that experts would never fall from them. And perhaps worst of all, they often defeat themselves. If you play safely for long enough against beginners or intermediates, they are likely to eventually make a mistake that gives you the win. It might teach you that long, drawn-out conservative play is the road to victory. But what will you do when the expert never hands you the game? What if the opponent is good enough that you must actively beat him rather than wait for him to beat himself? This is why you must focus all of your attention on playing experts when you are ready.